Well, first of all the imminent release by Artificial Eye of a three-disc DVD edition of Louis Feuillade’s classic serial Les Vampires gives me the opportunity to reproduce one of the great posters of the silent era. Has a touch of Twin Peaks about it, I’ve always thought, even if the curtains are the wrong colour. Anyway, Les Vampires (1915/16) is, of course, one of the great crime serials (or series) made by Feuillade for Gaumont, after he had thrilled audiences and revitalised the crime genre with Fantômas (1913). The five Fantômas films, based the popular crime novels of Marcel Allain and Pierre Souvestre, were particularly thrilling for being shown from the perspective not of the detective but of the master criminal, with his genius for disguise and eluding the police. Les Vampires, a little more conventionally, is shown from the perspective of the pursuing journalist Philippe Guérande, but it does have the huge plus of arch villainess Irma Vep, played in true iconic fashion by Musidora. Irma Vep, as an intertitle sequence that always raises a cheer, is of course an anagram of vampire. The Vampires are a criminal gang, supposedly inspired by the real-life Bonnot gang whose exploits chilled and thrilled the French just before the First World War. Irma Vep does not lead the group, though she does assassinate the Grand Vampire, a scene Feuillade apparently concocted after the actor playing the Grand Vampire neglected to turn up on set on time. The Vampires dress head to toe in black and general steal, kidnap and assassinate, before making daring escapes across picturesque Parisian rooftops. Guérande doggedly pursues them, aided by reformed Vampire Mazamette, but each time some new nefarious figure rises to prominence within the ranks of the Vampires. Les Vampires is, strictly speaking, halfway between a series and a serial. It is divided into ten episodes, but these were released irregularly, and it was until Judex (1917, also starring Musidora) and Feuillade truly adopted the serial form. 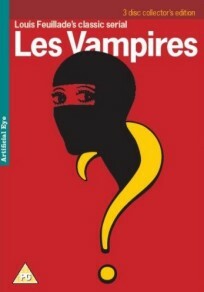 Stylish, transgressive and wildly imaginative, Les Vampires gains a particular power from combining the surreal world of the Vampires with the ordinary streets and buildings of Paris, doubtless making it all the more imaginatively plausible to contemporary audiences. Over three discs you get the ten episodes (between 40 and 70 minutes each), plus a selection of Feuillade’s short films: La Bous-Bous-Mie (1907), Une Dame Vraiment Bien (1908), La Legende de la Fileuse (1908), C’est pour les Orphelines (1916) and L’Orgie Romaine (1911). Music is scored by Éric le Guen. The release derives from the same Gaumont restoration which has been released on DVD in France by Gaumont themselves, though ranging over four discs, albeit with some extras not available on the Artificial Eye release. Les Vampires is released on 24 March.